12 tracks: Set of Hornpipes * Pay The Piper * Medley * Canon * The International Connection * March Evolution * Strathspeys and Reels * Solos * Duets * Keel Row Set * Jigs * The Music Man and Fiddler’s Rally. A live album from the previous four-time World Champions, under the direction of Pipe Major Terry Lee. Recorded at The Simon Fraser University Theatre, BC, Canada, and celebrating the Band’s 40th Anniversary. 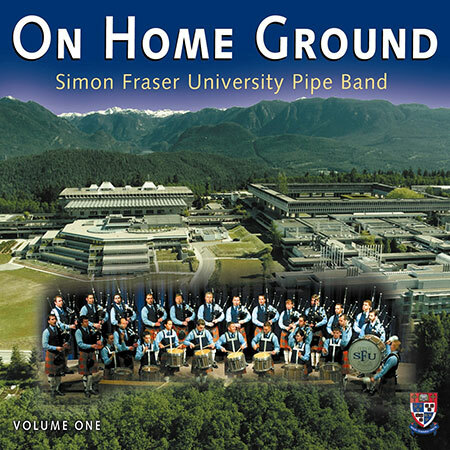 In 2004 the SFU Drum Corps won the World Drumming title for the second time - the Simon Fraser University Pipe Band is recognised as one of the best live concert pipe bands in the world. The album was produced by Murray Blair and is a mix of classic pipe band medleys, strathspey, reel, jig and march sets, plus special concert pieces, including solos and a duet. Guest musicians add fiddle, keyboards, bass guitar, whistles, border pipes, small pipes and bodhran to selected tracks, giving the album another dimension.